The brief summer of last week (oh sunshine and bright colors and swingy skirts, how I miss you!) has turned back into the April special--of rain, rain and more rain. Which gets me in the mood of cold weather and comfort food, like freshly baked cookies. Hmmm. Just writing about this kind of makes me want cookies. I created this layout for an Ella Publishing/ Write Click Scrapbook project. The topic was paper piecing, and I have not been a very inventive paper piecer up till now. Hence: behold, the easier paper piecing ever. 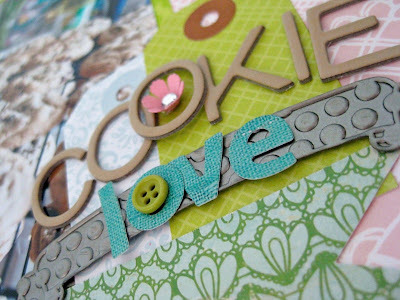 To make the cookie in the bottom left corner, I simply hand-cut a circle from kraft cardstock and then layered punctuation marks from a pack of Thickers. And voila--we have a sweet little cookie, with very little muss or fuss! 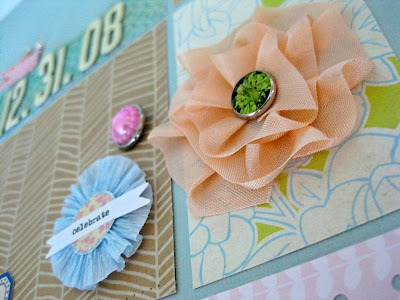 I don't normally create my own embellishments for layouts, but I love the homespun charm they bring. Hope you have a happy Tuesday! Have YOU ever paper pieced? What is YOUR favorite thing to read on this blog? 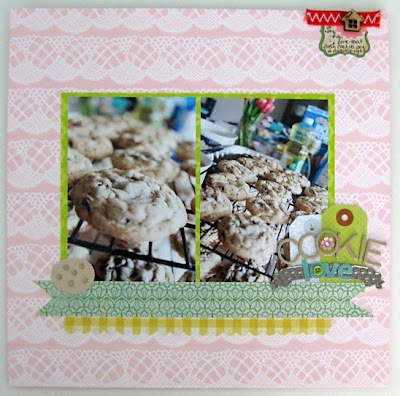 Love the colors in this layout and thosse cookies look so yummy! I've been paper piecing more recently. I thought it was a bit tedius at first but I always love the look! And as far as your blog, I love visiting to see your inspiring creations!!! 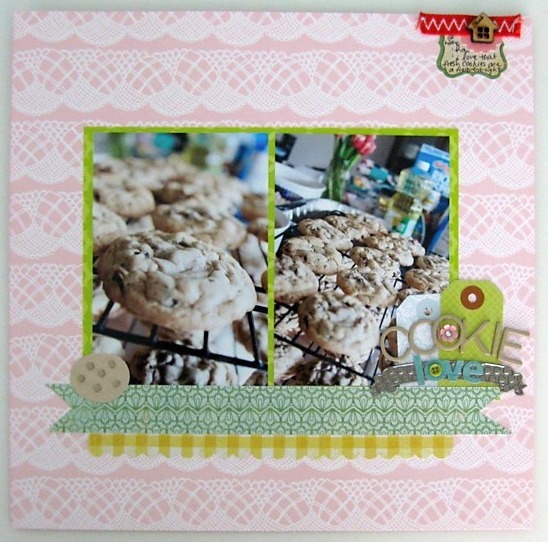 this turned out antastice~love it all!!! great work. i've done some paper piercing in the past..
absolutely love the page on the ella blog! just recently tried paper piercing and i am smitten! love seeing your craftiness! I love seeing the things you create, but also reading about your life. What a cute page!! :) Love! I very rarely paper piece. I love seeing your layouts--you create with the happiest colors! love the way you did the title too! those cookies look yummy! I haven't paper pieced in years and yet I see all these great projects with the technique. I also saw your layout in Scrapbooks, Etc. Congratulations! I haven't paper pieced in a very long time. I like paper piecing flowers for cards. I love reading all your posts, keep 'em coming! absolutely adorable. now i want a cookie too. lol!!! Lovely page! Those pics are yummy! I have paper pieced, but I am not one that enjoys fussy cutting. I am doing it more, oddly enough. Great page! I don't think i have paper pieced. I love all your posts whether its your new pages or the everyday real life stuff! 1. I have paper pieced, but not for awhile. Must try it again! 2. Your layouts always make me happy. They seem REAL somehow...done with sincerity I suppose. I love paper piercing especially when you join the holes with a white gel pen....looks like stiching, they call it faux stitching. I love reading your blog because you are honest and you share your culture which fascinates me! I'm not 100% sure what paper piecing is exactly so I don't know if I've done it but I think I might have. What's my favourite thing to read on this blog? I love when you share your LOs, but truly I love everything you have to say! Just keep on doing what you're doing. I'm no good at it either, but you did a great job!! And the pictures are awesome! Oh - and my white kitchen is SO easy to keep clean! My cupboards have a shine to them and everything wipes off so easily! Love that. And I love your blog! Everything you post about. A big thank you and some scrappy goodness!